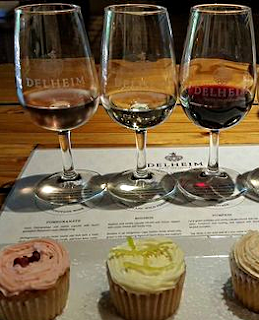 Bianca Coleman for South Africa's Independent visits Delheim's tasting room to experience four wines, including two Pinotages with four cupcakes. She 'began with a lovely light Pinotage rosé full of ripe red fruity aromas brought out by the 4% Muscadel. The cupcake, with grenadine-flavoured cream cheese icing, picks up on the pomegranate notes. It’s worth remarking Delheim has been making this rosé for 41 years'.